You don’t have to keep the water and the best way to dispose of it would be to dump it into the ground just in case it might have been “blessed” by some of the New Agers who frequent the wells where it was obtained. For those who have never heard of it, Glastonbury water comes from a town by the same name in Somerset, England, which is known as the UK’s New Age hub. It flows from what is called The Chalice Well at a rate of 250,000 imperial gallons per day and is said to have never failed to flow, even in times of drought. Iron oxide deposits give the water its distinctive reddish hue. The nearby “White Spring” is the source of 95,000 liters per day with its water containing high concentrations of calcium carbonate resulting from a flow through underlying limestone. 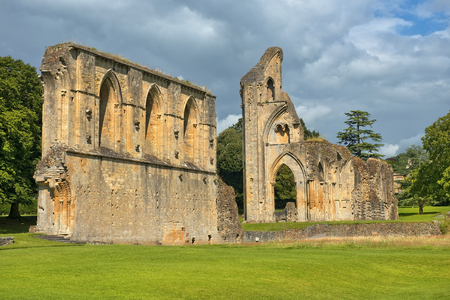 Yet another spring, known as the Well of St. Dunstan, was located under what was once the Glastonbury Abbey which now lies in ruins. Many people believe these waters have healing powers, some of whom have made sworn statements about being cured of ailments such as asthma. A variety of myths have been associated with the well and its water. King Arthur is believed by some to be buried near Glastonbury. Others say the site of the Chalice Well is where Joseph of Arimathea placed the chalice containing drops of the blood of Christ shed at the crucifixion, thus linking the Well to speculation surrounding the existence of the Holy Grail. However, these myths have all be debunked. Of particular interest is the design of the well cover on the Chalice Well which was given to the town as a gift in 1919. Designed by Frederick Bligh Bond, a church architect and archaeologist, it bears the overlapping circles of the Vesica Piscis symbol with a sword or spear piercing it. The circles are said to represent the overlapping of the inner and outer worlds and the spear represents Excalibur, the sword of King Arthur. Some say the circles are an important symbol from Kabbalism while others point to Freemasonry for the design. Some believe the overlapping circles symbolize rebirth, a formula of sacred geometry, a “harmonious tuning of subtle energies” or a reference to the female aspect of deity. Today, Glastonbury is best known for its five-day music and performing arts festival which draws close to 200,000 people a year. Artists such as the late David Bowie, The Who, Lady Gaga, and Pharrell Williams have all played at the festival. The German-born New Age guru, Eckhart Tolle, used to live in Glastonbury. Eileen Caddy, a co-founder of Scotland’s New Age hub known as Findhorn, was at a sanctuary in Glastonbury when she first heard the “voice of God” while meditating. The Wiccan high priestess known as a Sally Morningstar, author of more than 26 books on divination, magic, wicca and astrology lives in nearby Somerset and teaches witchcraft and natural magic at Glastonbury. It’s obvious that some very non-Christian activities take place at Glastonbury so the best way to dispose of any water obtained from the site would be to pour it into the ground.